These products are only available in the United States. Ronan and Erwan Bouroullec created this expansive armchair by using an extremely strong, precisely shaped knit which is stretched over the metal frame like a fitted stocking. Thanks to the knit sling cover, the slow chair combines soft comfort with ergonomic support, which is further enhanced by thin seat and back cushions. The translucent sling cover replaces the thick cushions of traditional armchairs, resulting in a design that is lightweight, yet generously proportioned. In the living room or on a sun porch, the slow chair maintains an understated presence while offering superb comfort. Materials: Frame/Cover: Tubular steel frame with extremely strong, precisely shaped knitted fabric which is stretched over the frame. Upholstery: Polyurethane foam and polyester fiber, including a seat cushion and two backrest cushions. Seat height: 330 mm (applied load 230 mm, measured in accordance with EN 1335-1). 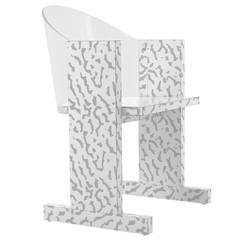 Base: Die-cast aluminum legs with powder-coated finish. Glides: All legs fitted with hard glides for carpet; felt glides optionally available for hard floors. Applications: Recommended for home use only. 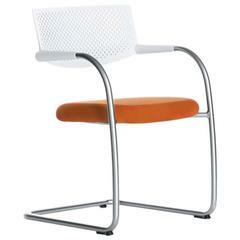 Chair dimensions: Width 95 cm Depth 93 cm Height 89 cm Seat height 33 cm. von The Mauser Manufacturing Co.